It seemed fitting as we packed up to leave Normandy Farms that there was a light rain falling. This has been our standard weather during our travels through the New England states. Well, it is Spring, so we’re not complaining. As drives go for us, this one was really not too bad. It was about 150 miles, which equates to roughly three hours of road time. The drive was almost entirely Interstate highway so the goal was keep it straight and keep the speed constant. Shortly after lunch we arrived at Bayley’s Camping Resort in Scarborough, ME with again, a light drizzle. After checking in at the office, we wound our way to the rear of the park where there was a group of pull-through “big rig sites. A pull-through site is not always necessary, but it is a nice luxury when the rain is falling and we want to get set up quickly and get out of the rain. Less than an hour later we were comfortably inside, sitting in our recliners, with the fireplace on. Saturday morning didn’t bring us any better weather, as it was overcast and a light drizzle in the air. We only had the weekend, so we didn’t have time to waste, out to explore in the rain we went. Stop #1 was to satisfy the sweet tooth that we both have. Add in the fact that the stop involved donuts made it all the more exciting. Betsy’s research in the area for gluten free food had revealed a donut shop with gluten free donuts, with several high ratings on the GF for Me app. Now, just as a reminder, I don’t get the opportunity to have a “good” gluten free donut very often. So the combination of GF donuts, a convenient location in Scarborough, ME, and both of our love of donuts, made it a must destination. The Holy Donut turned out to be almost a “religious” experience. 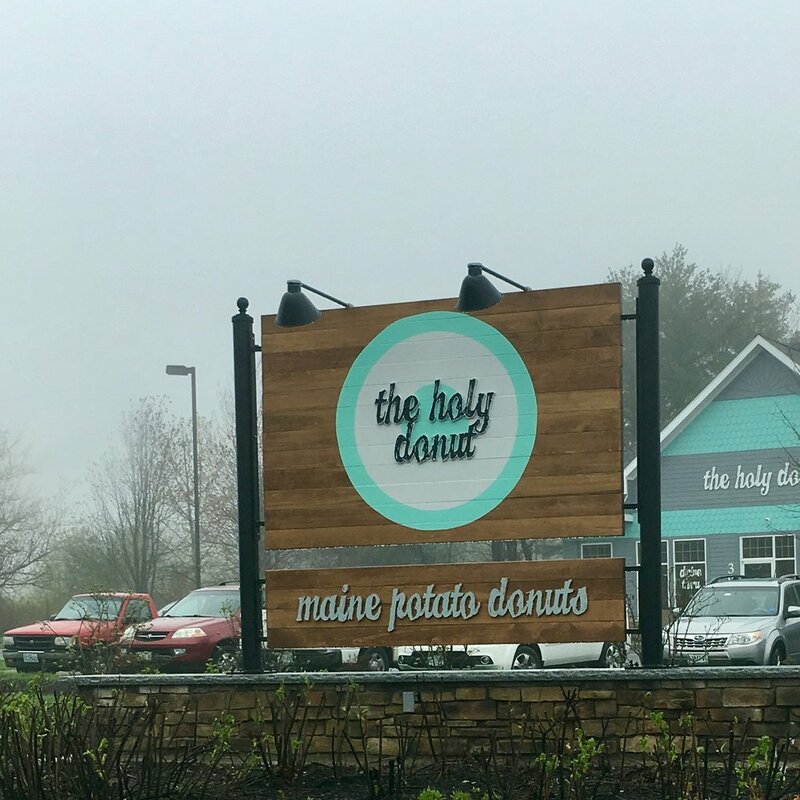 The Holy Donut started in Portland, ME, but had recently opened a location in Scarborough, ME. When we arrived late in the morning on a Saturday, it was obvious from the parking lot that the initial excitement had not yet warn off. All of the parking spots were filled and there was a line at the drive-thru window. With this being our first visit we knew we wanted to go inside and have a look around. Inside it was definitely big for a donut and coffee shop, think a big Dunkin’ Donuts with seating. There was a prominent display behind the counter of six gluten free donut flavors. On the counter was a display with the regular flavors which numbered twenty. Behind the counter was a beehive of activity with people making donuts, boxing up orders and running cash registers. We each picked out three flavors, mine being GF of course, to get a good variety. Betsy and I have had the discussion multiple times about our preferred donut type. (When two people are together all of the time you can cover a wide range of topics!) I prefer a cake-type donut, while Betsy leans towards a more yeast-type raised donut. The beauty of The Holy Donut is that their donuts are sort of a blend of the two. The Holy Donut refers to their donuts as potato donuts, which gives them this unique texture. Call them what you want, they were darn good donuts! With our donut stop out of the way, it was time to move on to something a little healthier, the Portland Farmers’ Market. Betsy and I have a history with farmers’ markets. We enjoy walking through them, and ICED by Betsy started its’ life as a farmers’ market vendor. I had recently seen an article on the USA Today app which listed the best farmers’ market in all 50 states. With Maine being our destination, we were interested to learn that the Portland Farmers’ Market was Maine’s best. The market was easy to find in Deering Oaks Park in downtown Portland. Farmers’ markets are easy to locate when you know to look for the gathering of 10’ x 10’ white easy-ups! Even being early in the season, the farmers had a pretty good selection of vegetables, meats and plants. The market was definitely weighted more towards farmer-type vendors, rather than the complimentary-type vendors we are used to seeing. A walk through the market netted us some good looking kale, fresh carrots and a special on ground beef we couldn’t pass up. Best of all, I used my umbrella more as a walking stick than as an actual umbrella! Now it was time to head towards what some people call a Maine institution, L.L. Bean. Yes, the L.L. Bean Flagship Store is located in Freeport, ME, a short 20 minute drive from Portland. Considering it is open 24 hours a day 365 days a year, there was no excuse for us not to visit the Maine gem. When we arrived, we quickly discovered that the Flagship Store is more of a “complex”. After the obligatory picture at the big L.L. Bean Boot in front of the main building, we wandered through the multiple buildings. Now we’re not typically L.L. Bean-type people, but we definitely enjoyed looking at the variety of things they sold and marveled at the number of people there on a rainy Saturday. We did not escape L.L. Bean world without purchasing something. Betsy has been on the hunt for a good pair of slippers for quite some time and she always brings it up on those cool mornings when Charlie’s floors are not exactly warm. There, on the Sale rack, was the perfect pair of fuzzy slip-on slipper shoes, in the right size. After trying them on, and also trying on a couple of other options, she was sold on them. That was it, we were officially L.L. Bean customers, and at the Flagship Store none the less. Donuts, Farmers’ Market and new slippers. All in all a pretty good day! Sunday was a little bit of a break in the weather. We even saw that big, bright, yellow thing in the sky! We made the short drive to Old Orchard Beach for a look and a walk. The large tide changes (12 - 15 feet) are amazing to see, and even more amazing to observe on a typical beach. We walked the beach, listening to the waves and watching the kite surfers in the water. Yes, it is early May and there were kite surfers in the water. I had to stop and ask one of them what the water temperature was, 43 degrees! Yikes! Betsy had already gone down and touched the water and commented that it was cold. 43 degrees is REALLY cold! We drove down the coast on Route 9 to the Saco River Inlet. The names were appropriate as we drove down the coast: Grand Beach, Surfside, Ocean Park, Bay View, and Saco Bay. We passed on the additional 30 minute drive south to Kennebunkport. Sorry President Bush, we’ll have to visit on our next trip through Maine! The day ended as Betsy thinks all days should end, with ice cream. It was a short drive from Bayley’s Camping Resort to Bayley’s Ice Cream. Coincidence, I think not! I’m not the ice cream connoisseur that Betsy is, but the peanut butter soft serve was pretty darn good! Monday was moving day, but not before one last stop at The Holy Donut! That’s right, before pulling out from Bayley’s Camping Resort, we had to go back and get some donuts to freeze and even get a 1/2 dozen for Annette, Mike, Jay and Karen, who we’ll meet up with at the end of our final moving day for almost six months. That’s right, next stop, Trenton, ME, our home for the summer! Acadia National Park will be in our sights.